AND A HAPPY NEW YEAR TO ALL AJA MEMBERS! 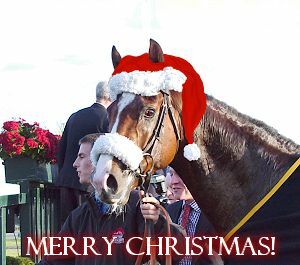 The weather may have stopped racing at Cheltenham on Saturday 13th December but nothing was going to stop the AJA Christmas party held at the racecourse that evening to celebrate our Champions who braved the floods to get there! The Champions Line Up: Emily Jones, Serena Brotherton, Nick Scholfield, Amy Ryan, Vice President Dr Philip Pritchard, Alyson Deniel and Joshua Moore. 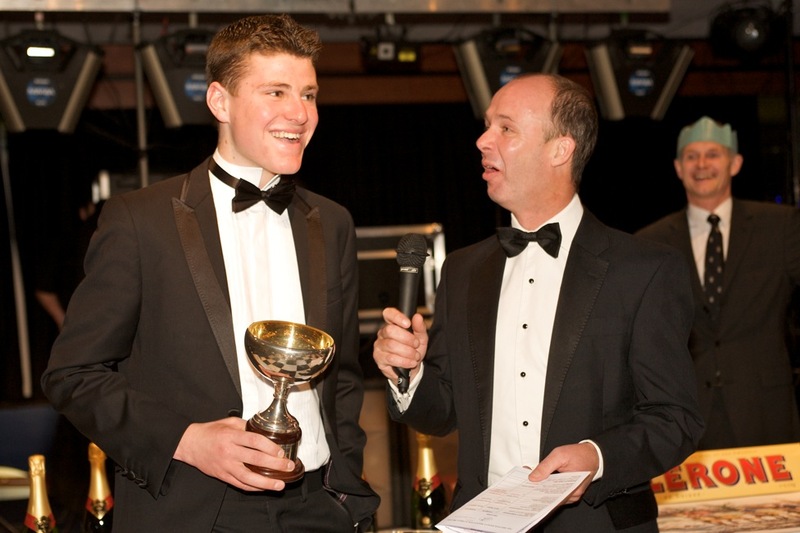 Nick Scholfield, Champion National Hunt Amateur Gentleman Jockey 2007/8, is interviewed by Luke Harvey and thanks Paul Nicholls for his support. Nick rode 20 winners in the season, one ahead of his nearest rival, the previous season’s Champion Thomas Greenall. 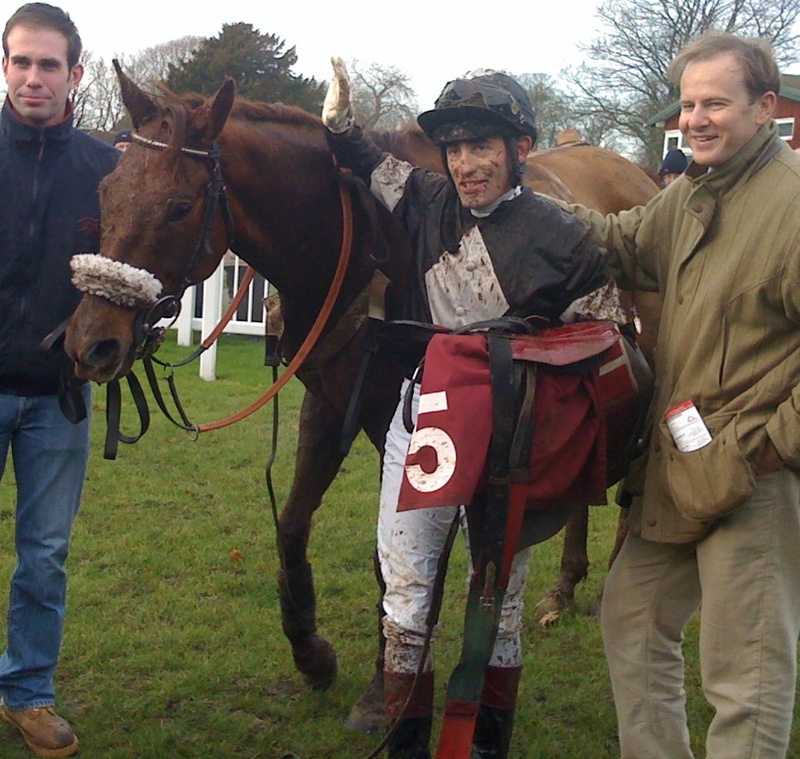 With racing abandoned, the Champion National Hunt Amateur Lady Jockey for 2007/8, Rose Dobbin, was unable to attend. Rose was also awarded the President’s Prize for the year, having ridden the most winners of any other amateur jockey in the season with 21 wins. 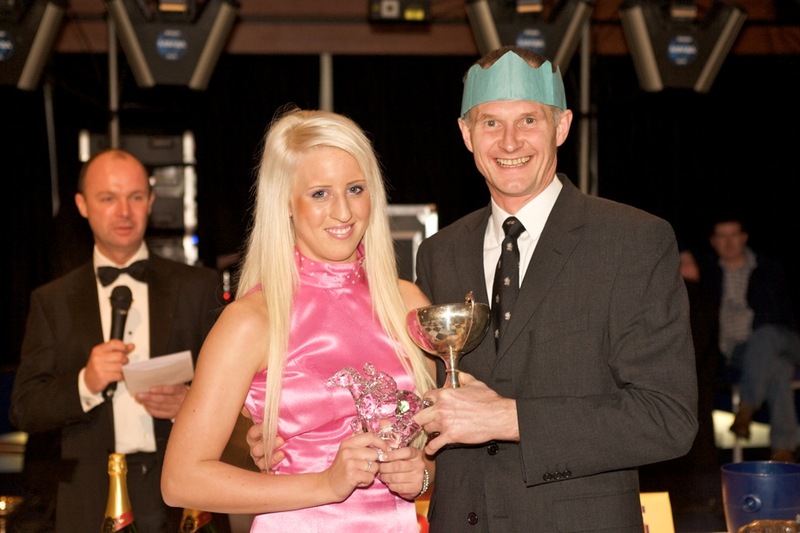 Amy Ryan, Champion Flat Amateur Lady Jockey 2008, receives her Champion’s Trophy from AJA Vice President Dr Philip Pritchard. 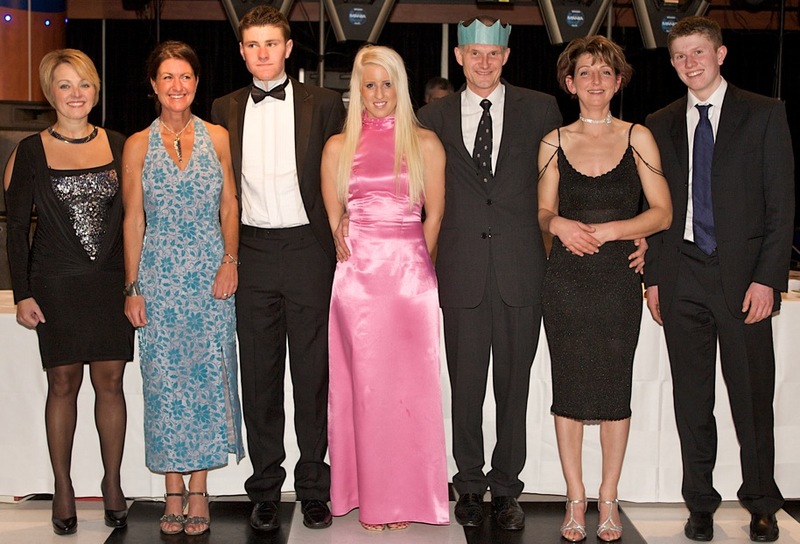 Amy rode 6 winners in the season, with the runner-up slot being shared by three lady jockeys with 4 wins each, those being Serena Brotherton (who also won the Bathwick Series), Alyson Deniel (who also won the Queen Mother’s Cup) and Emily Jones. 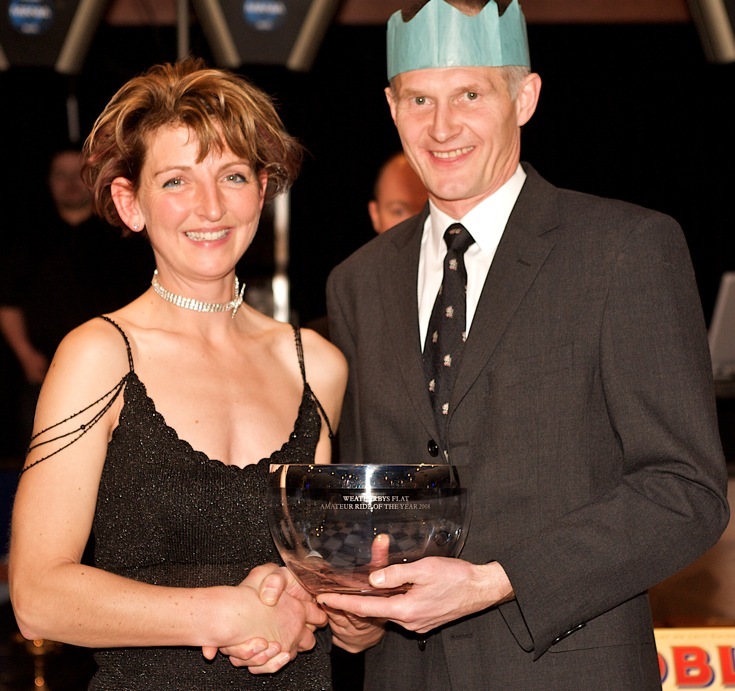 Alyson was awarded the Weatherbys’ Flat Ride of the Year Award for her ride at York. Many congratulations to all of our champions! Further pictures of the evening can be viewed on the AJA Group on FACEBOOK. Very many congratulations to both Danny Cook and Gemma Gracey-Davison who have both done fantastically this season in representing Great Britain in the FEGENTRI series. 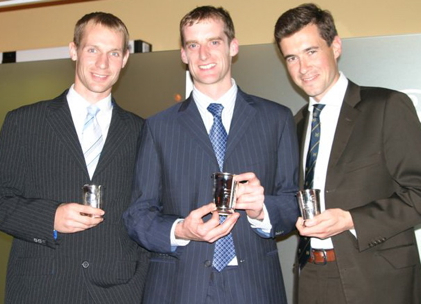 Danny (pictured above (left) with Donal Macauley (IRELAND) (centre) and Paul-Henri de Quatrebarbes (FRANCE) (right)) ended the FEGENTRI season in the runner-up slot over jumps with Donal Macauley Fegentri World Champion for the gentlemen riders and Paul-Henri de Quatrebarbes taking the runner-up slot on the Flat. This was a fantastic achievement for Danny, especially considering that he missed the first Fegentri race of the season in Belgium as well as not taking part at either Sandown or Switzerland. Gemma Gracey-Davison also did fantastically well (pictured on the right above in Mauritius yesterday), also finishing in the runner-up slot to Ireland with Nadine Forde taking the Ladies World Championship. Considering the demands made on both Danny and Gemma back home with their successful amateur careers in the UK, they have done magnificently and we are very grateful to them for being such excellent representatives for Great Britain. 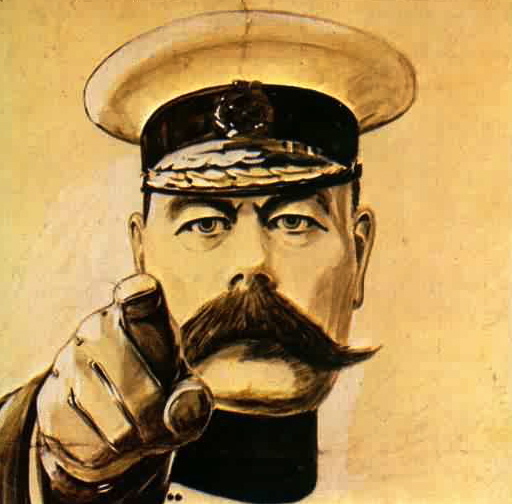 YOUR AJA NEEDS YOU – at the AJA Christmas Party! STOP PRESS!! PRICES SLASHED 50%!!!!! We are determined to have a great party on 13th December at Cheltenham Racecourse!! SAVE 50% ON TICKETS NOW SELLING AT ONLY £20 EACH!! SAVE ON COST OF DRESS HIRE – LOUNGE SUITS WILL DO!! HURRY AND CALL O1886 884488 AND BOOK YOUR TABLES NOW BEFORE THEY ALL SELL OUT!!!!! DEADLINE FOR TICKETS NEXT TUESDAY 9TH DECEMBER!! Since Folkestone Racecourse twinned with Pompadour Racecourse in SW France in 2006 both courses have taken pride in entertaining each other and celebrating the relationship at two meetings each year on either side of the Channel. This year Neil Mackenzie Ross, Folkestone’s Clerk of the course, added a new race to the card for English and French amateur jockeys, the Prix de Chateau de Pompadour Handicap Hurdle. Neil said, “We wanted to make a bit more of the Anglo/French theme and I thought that an amateur race for both English and French Jockeys would make a spectacle on the day. It was well supported at the entry stage, but I think the rain must have put off a few horses. However, the day was a great success and we intend to continue to build on this meeting”. Photographed in the paddock before the race are: M Jean Cousteres (General Secretary, Le Club des Gentlemen-Riders et des Cavalières), Jean-Philippe Boisgontier, M Jean de Bretizel (Vice President, Le Club des Gentlemen-Riders et des Cavalières), Florent Guy, Cyril Coste, David Bellocq, Patrick Pailhes, Danny Cook, Brian Toomey. French amateur jockey Cyril Coste rode his first winner outside France on DOCTORED, who was in front before the home bend and stayed on in the heavy ground to win by 21 lengths from fellow compatriate Patrick Pailhes on DRIZZI with Danny Cook for GB in third. Many congratulations to France on their victory and many thanks to Monsieur Francis Delord, President of Pompadour Racecourse, for his valuable sponsorship. If you would like to join the delegation who will be visiting Pompadour in July 2009, please contact Emma on 01303 266407.